This year’s CPAC has shown the conservative movement in the United States is facing a crisis of its own making, as the white supremacists it has nourished since its inception are emerging from the shadows and demanding a seat at the table. But that wasn’t what Schneider said. Rather than acknowledge and take responsibility for the extremists their movement has birthed, conservatives are feigning ignorance and blaming a familiar boogeyman for their problems, all while continuing to celebrate the fringe positions they claim to decry. Schneider, the executive director of the American Conservative Union, the organization behind CPAC, was delivering a speech titled: “The Alt-Right Ain’t Right At All.” Initially, it seemed he was going to denounce the collection of neo-Nazis and white nationalists who have adopted the euphemism “alt-right” to rebrand their bigotries as new and edgy. Instead, he offered an implausible explanation for their rise that left the room largely silent—either due to confusion or lack of interest. The alt-right wasn’t the inevitable outgrowth of decades of right-wing politicians stoking racist animosity through coded language, he argued, but rather a mysterious leftist false-flag operation. “Just a few years ago, this left-wing, fascist group hijacked the very term ‘alt-right,’” he said. “They are not part of us. They stole the term specifically to confuse us.” He added, for emphasis: “They are nothing but garden-variety, left-wing fascists.” Schneider specifically referenced an incident from November during which prominent white-supremacist Richard Spencer—famous online for getting punched in the face—gave a Nazi salute to then–President-elect Donald Trump. To claim Spencer is a leftist, rather than the culmination of decades of movement conservatism, takes staggering levels of delusion, paranoia, and self-pity. Ignorance about the alt-right is dangerous, as hate crimes against Muslims and Jews continue to rise—including on Wednesday when a white man in Kansas shot two men he believed to be from the Middle East, killing one of them, and injuring a bystander who attempted to intervene. Outside the ballroom, Spencer was surrounded by members of the media desperate for a quote. After about 45 minutes, he was ejected from the premises, despite having purchased a ticket. “His views are repugnant and have absolutely nothing to do with conservatism or what we do here,” said CPAC spokesman Ian Walters, according to NPR. Schneider’s speech, and Spencer’s ejection, came days after “fellow traveller” of the alt-right, Milo Yiannopoulos, was disinvited from the conference after comments he made condoning pedophilia were widely circulated. Despite years of making money pedaling transphobia, racism, and misogyny, Yiannopoulos also lost a lucrative book deal from Simon & Schuster as a result of the uproar. That Yiannopoulos was invited under the pretense of defending free speech, regardless of content, made CPAC’s decision all the more obviously hypocritical. 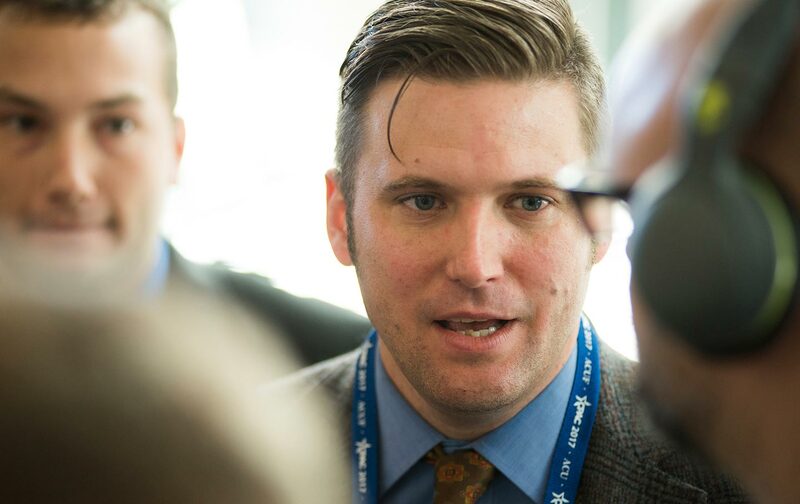 CPAC’s nominal gestures toward disavowing white-nationalist fascism rang hollow. For one, the conservative movement from William Buckley and Barry Goldwater, through Ronald Reagan and Lee Atwater, and now to Trump, has always been about maintaining and reproducing a society structured around white, patriarchal dominance. The new, more explicit manifestation of their project is hateful to them, so they want to banish it and retain the disingenuous, comfortable pose of colorblind, principled conservatism. More immediately, though, the very day conservatives patted themselves on the back for ousting the nearly universally reviled Spencer from the conference, CPAC hosted a joint appearance between White House Chief of Staff Reince Priebus and Chief Strategist Steve Bannon. Prior to his top role in Trump’s campaign, Bannon headed Breitbart, a far right-wing site that employed Yiannopoulos until his recent comments. While at the helm at Breitbart, which he once referred to as the “platform of the alt-right,” Bannon did more than any other individual to provide a platform for the movement Schneider claims is in fact an outside interloper. Beyond that, deputy assistant to the president Sebastian Gorka, a crowd favorite, has worked “with openly racist and anti-Semitic groups and public figures,” according to a new investigation from Forward. In another context, these comments might seem unremarkable. But given the day’s prior events, and Bannon’s proximity to Yiannopoulos—and Spencer’s ethereal, quasi-movement, if not Spencer himself—they take on a far more sinister quality. It’s not difficult to figure out what he means by “our world,” not withstanding his passing comment that “no matter our color,” we all bleed “the same red blood of great, great patriots.” By Trump’s own acknowledgement, rhetoric decried even by most Republicans as “too controversial” only a year and a half ago is now mainstream conservatism. And if Schneider is so concerned about fascists, he ought to pay more attention to the nascent administration. Amid his project to advance white nationalism, Trump is undermining institutions designed to check the executive branch. Trump kicked off his speech to CPAC by reiterating his claim that the “fake” media is an “enemy of the American people.” His administration has also waged repeated war on the federal judiciary. “As Trump’s strategist, Bannon appears both to open up and to navigate this ambiguous space between the radical right and open fascism,” Alexander Reid Ross told The Nation. He is the author of the recently published Against the Fascist Creep, an academic study of how fascism can migrate from radical-right parties into the mainstream, and how fascists can take hold of a political party longing for a lost, imagined golden era. Lightstone was much more enthusiastic about the original Yiannopoulos invite, calling it “great,” and said he was not a racist because he has dated black men. She said she was unfamiliar with his recent comments, and did not defend them. To be sure, Yiannopoulos is also disgusting, and has been for years. That conservatives are ready to rail against Spencer and defend Yiannopoulos up to—if not including—his latest remarks, is further evidence that Schneider’s accusation that the left is to blame for the rise of explicit white supremacy in the conservative movement is pure fantasy.